ELENA GRECO’s primary creative focus is on producing multimedia projects that entertain, educate and enliven. As a mezzo-soprano, she sings a wide range of genres and styles, both as a soloist and as an enthusiastic ensemblist. As an opera singer, her focus is on the full lyric mezzo French, Italian and verismo repertoire. She is particularly dedicated to Spanish art song, and is equally at home in French mélodies, musical theater, American songbook and jazz. Her voice has a wide range of colors, and she always strives to convey the essence of the music in its natural style. Also a classical pianist, Elena plays jazz flute, was once a harpist, and occasionally composes. Whatever the genre, she wants the audience to be inspired and thoroughly entertained. 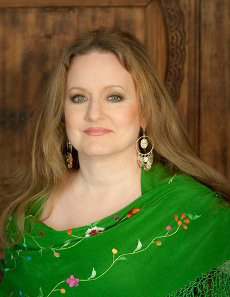 Elena is also a holistic voice teacher, utilizing an organic technique that encourages freedom of expression and longevity of the voice. Her work includes foundations of breathing, airflow, bel canto technique, passaggio, registers and sensory development. In addition, she teaches healthy, effective crossover technique for classical singers who want to learn to “belt” and/or sing musical theater or popular music authentically without harming their classical technique. She also coaches singers who want to address non-vocal issues that impact their singing, as well as older singers returning to singing after a hiatus. Elena is producer, artistic director and co-music director of ELENA GRECO MULTIMEDIA PRODUCTIONS™, roles which allow her to merge her musical skills, her training as a counselor and her technology and administrative skills into multimedia productions that offer entertainment, education and healing to her audience. It is her intention that these concerts foster transformation and the expansion of creative energy in both performers and audience, through music, visual art, taste, technology and other creative expressions that expand the senses. To further her intention to bring healing through music, Elena founded and hosts THE MUSIC SALON™ every first Sunday of the month to provide a haven for creative artists to share their art among colleagues, and to receive support in their creative process through experiential and informational segments. In addition, the CONCERTS FOR HEALING™ series presents concerts focusing on issues of health and ecology, uplifting and entertaining through beautiful music while educating about important issues. Other upcoming projects of ELENA GRECO MULTIMEDIA PRODUCTIONS include THE FLAVOR OF SPAIN™, a concert series which explores the exotic cultural influences that unite to create the unique, passionate and thrilling sound of Spanish music, and OPERA REALE™, which presents simple, affordable and unusual multimedia productions of great opera with the finest local singers and musicians, focusing on expressing the composer’s music at the highest level, entertaining and inspiring the audience, and fostering creative development for the singers and musicians. In addition, Elena enjoys performing for charitable organizations and centers, particularly those which serve the elderly. She maintains an active voice studio, where she teaches an organic technique that encourages freedom of expression and longevity of the voice, and also one which allows you the freedom to color your voice to suit the genre or emotion you are singing. She also encourages exploration of the connection of voice-body-psyche as instrument. Elena has a keen interest in creative expression in all forms, as well as a fascination with, and support of, small or indigenous cultures, particularly in melding different cultural influences into new and vibrant forms of expression while keeping old traditions alive; she believes that there is much richness and meaning to be found in the cultural traditions of small but ancient cultures, particularly musical ones. She also believes strongly that sharing our creative arts is a simple but extremely powerful means of enhancing communication and understanding, and that expression through the creative arts drives human evolution and therefore deserves and requires our respect and support. She very much wants to bring healing to people through music, which she believes is the most transformational and uplifting tool on the planet. Her life is dedicated to creativity and allowing it to flourish in all of us. Virtually everything she does comes from this commitment.